This Front Load Multi-Bill & Coin Changer is designed to break larger bills into smaller bills of "two" denominations and coin (or tokens). It features a high security design, Pyramid Validator, a 2 x 700 note cartridge dispenser and a Hopper. It’s designed with a Stainless Steel Face Plate. 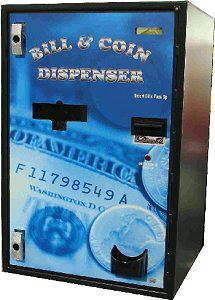 This machine provides change to your customers while helping to reduce lost revenue and lower labor costs. This model is ideal for the Vending, Car Wash, Laundry and Amusement Industries.